I’m a little behind on my writing for this week, but nothing I can’t catch up on. I’m not quite used to writing in the family room with the television set blaring in front of me. It has affected my productivity somewhat but I’ll adjust or get a new computer upstairs in my office where I normally work. Shipped off my beta read comments to the author, so I’ve now discharged that commitment. On track for the weekly blogging and monthly flash challenges. Link to my cumulative stats is here. 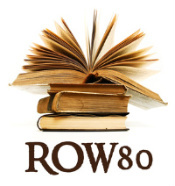 Link to a list of other ROW80 participant progress reports is here. Good job on the submission. It’s easy to let time go by without putting anything out there. Thanks! Only bad thing is it tends to hijack my attention, obsessively checking my email. Oy!